There might exist some lonely standalone software developers that create software without any other person involved, but my guess is that there are not many of them. Communication is an essential skill in software development, testing and project management… and life. As feedback is a key communication tool, I was therefore very interested when I stumble on this book about feedback written by an Agile coach. 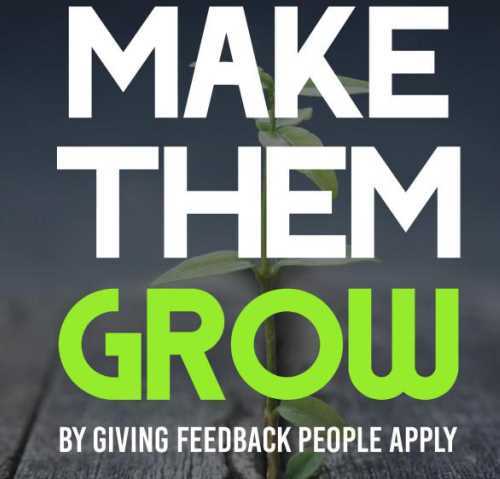 “Make Them Grow by Giving Feedback People Apply” is not a long book to read, but it deals in a very pragmatic way about the important topic of feedback, both about positive and negative behaviors. As being Agile seems the “way to go” for most software development teams, the values of courage, trust and honesty will all be supported by putting in practice the advice contained in this book. After reading it, I think that it goes way beyond the software development part of our life. You can give it also to your partners and teenagers. You will have a good communication moment by just starting to have a conversation about it. Which bring us back to Agile, where conversations are one the main tool. Think about the results you can achieve by giving people a simple feedback on their contribution to the development of the company. It is relatively easy to do, but if you want to do it even more effectively, read this book to the end. It’s all about giving perfect feedback in any situation. The feedback that won’t be rejected immediately, but will be applied or at least thought over. The principle of reciprocity will work. If you give someone a feedback, that person will be more willing to give it to you. Thus you increase the chance of receiving feedback, which you need for your own development. Day after day you build an environment of openness. Paradoxically, by contributing to the development of others you also contribute to your own development. This is an excellent example of a win-win situation. Another important thing about giving feedback is to learn to distinguish between the perspective of I from the perspective of you. Everyone, in general, has a good opinion about himself and when making a decision believes that he is right. When you inform someone that he has done something wrong and he thinks otherwise, it causes an internal conflict. Such a person immediately start to defend himself and is not interested in listening anymore. You can talk about your feelings and about the impression something made on you. At the same time, however, you want to appreciate the person’s efforts. For example, although sometimes you are full of good intentions, when you make statements like, “I am proud of you“, you have not directly acknowledged the person involved.